Join olive oil producer Corinna Tonti and Letizia Mattiacci owner of alla Madonna del Piatto cooking school for a truly local and personal experience of Umbria’s crafts and artisan delights. Villa Rosy, a XIX century farmhouse at the heart of the award-winning San Potente olive estate near Assisi in Umbria will be your home for 7 days at the peak of olive harvest. 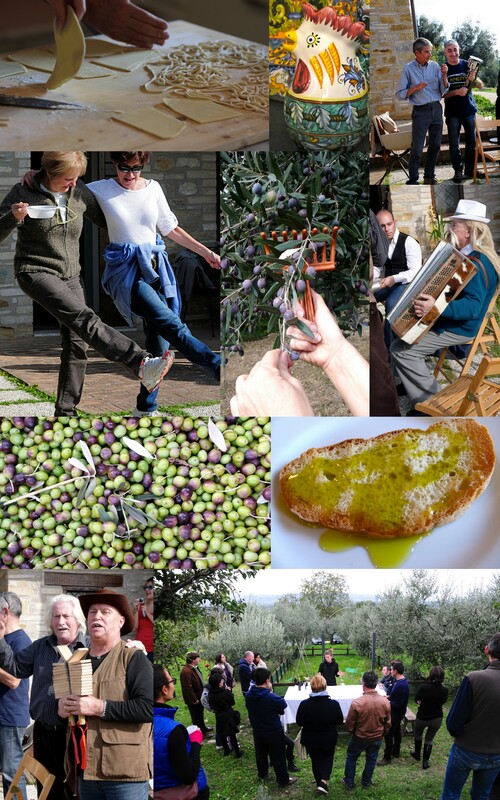 During your stay you will take part to all steps of olive oil production, from harvesting olives in the groves surrounding the farmhouse, to the plate, where “Umbria’s liquid gold” makes everything better and healthier. You will visit a working mill, taste the oil the very minutes it’s pressed and learn to recognize the nuances of its flavor. Alla Madonna del Piatto cooking school is listed by National Geographic among 500 places where to eat around the globe. Letizia will open her kitchen for you to learn to make fresh pasta, farro, crostata as well as other autumn recipes of the Umbrian countryside. There will be time for visiting local sights like medieval Assisi, Perugia, Foligno and Deruta home to Italy’s greatest ceramic makers. As olive harvest is short, this tour is a special opportunity to share a unique time with two Italian families in a marvelous corner of rural Italy. Come to share our passion, our knowledge and family traditions. Come to live the Italian life with us! The tour includes 7 nights B&B luxury accommodation in the beautiful Villa Rosy, 2 cooking classes with Letizia at Alla Madonna del Piatto, olive harvest and tasting experience, making ceramic objects in a Deruta workshop, a textile tour, two guided hill-town tours, local transport and various lovely meals with plenty of wine. Cost is € 2180/person based on double occupancy, please inquire for further details and availability. The tour is limited to 8 participants.